If you deploy and manage your stack with Cloud 66, you are familiar with the notification emails you get when someone downloads the SSH key or when the deployment is finished. You can now get the notifications in [Hipchat (http://www.hipchat.com). Hipchat is a great chat tool for teams, with private and public rooms, color coded messages and iOS, OS X, Windows and web clients. Cloud 66 now supports Webhooks. This means now you can kick another process at the end of a successful deployment by simply opening an HTTP endpoint. 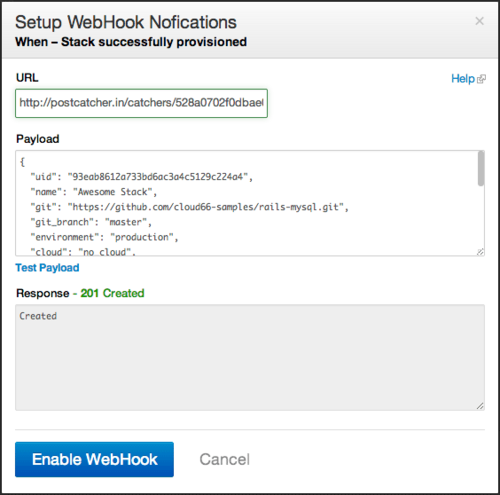 You can test your Webhook endpoints right from the UI and make sure they work before leaving them on autopilot! Learn more about the Notifications.